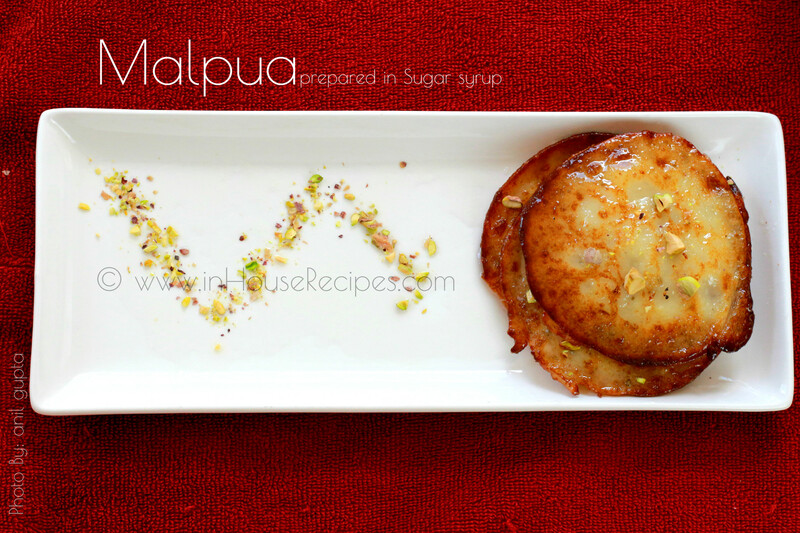 Malpua is primarily a Bengali cuisine dessert. 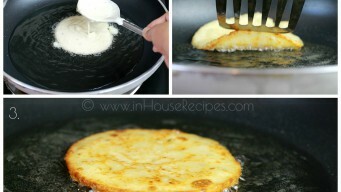 You literally fry a pancake and sip in Sugar Syrup (Chashni) to make it sweet. 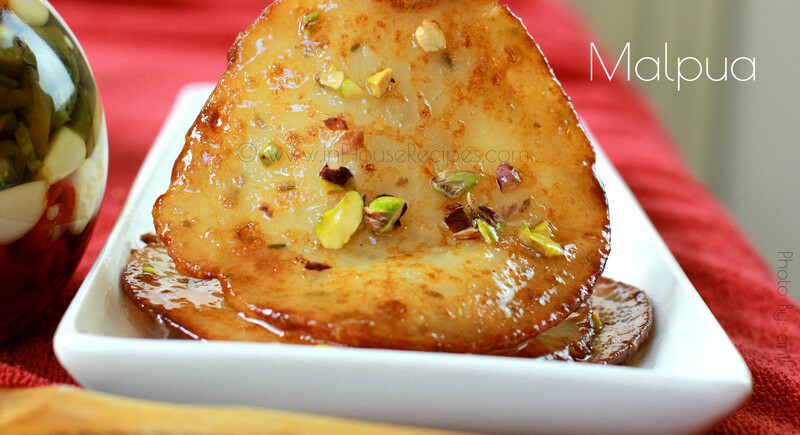 Malpua with Rabdi is just another combination where you top up the pancake with milky Rabdi. It is an optional addition though. 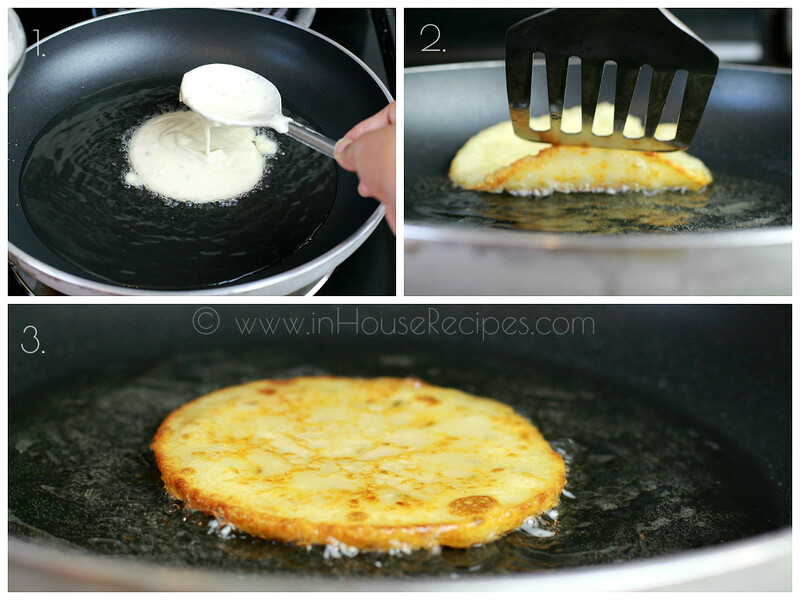 This recipe makes soft and fluffy pancakes with crisp outer edges. 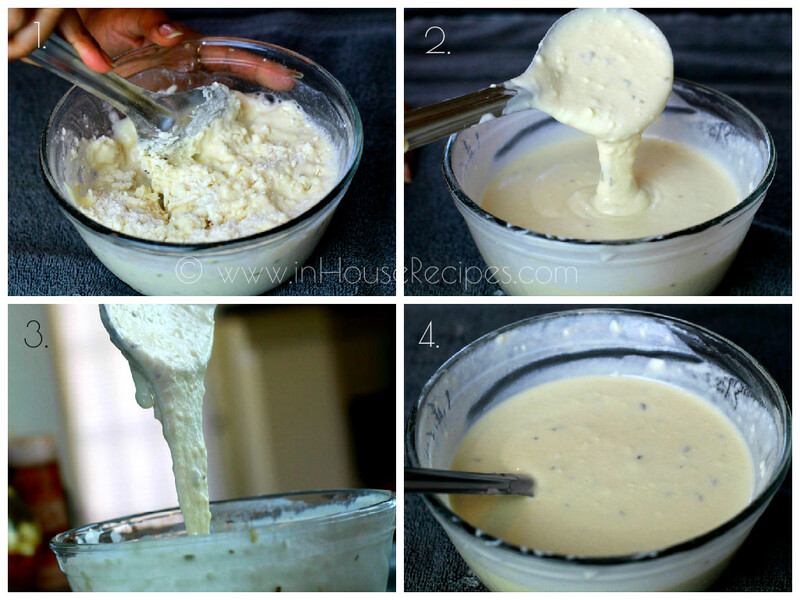 We have not included Rabdi and Chashni recipe here. 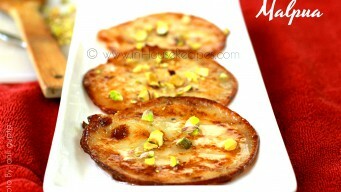 Chashni recipe is available separately on our catalog and the link has been shared later in the article. The video is pretty old but the recipe is tried and tested. The images in this article have been updated and we clicked them while we were re-trying the same recipe. Hence, do not worry and follow the steps as listed here or shown in the video. By the way, do let us know how the new pictures look, in the comments. 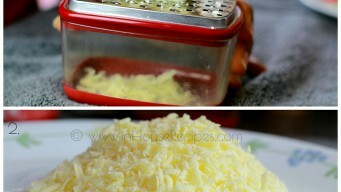 Start with finely grating the Khoya. 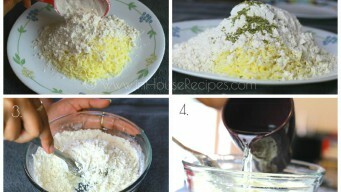 Once done, add All Purpose flour (Maida), Fennel seeds (Saunf) and Baking powder. Mix well. Add warm water gradually to make a smooth paste. Do not add all water at one go. Mix well. 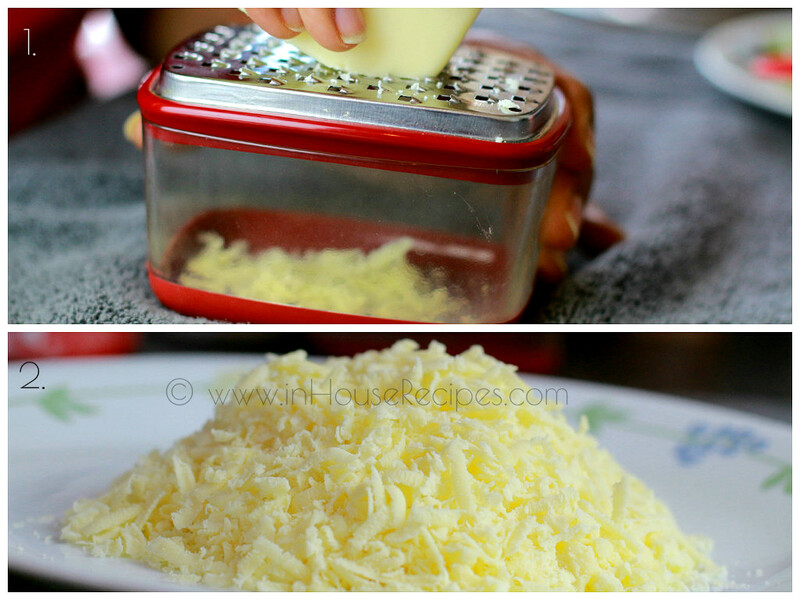 The consistency of the paste should be thick enough that it can be dropped too. It took us 1+1/2 cup of warm water to reach this consistency. You can watch the video for a better idea about the consistence that we are talking about. 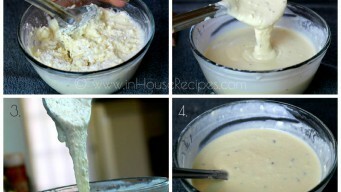 Mix the paste well for 5 minute. This will help in making soft Malpua. We should prepare the Sugar Syrup at this time. 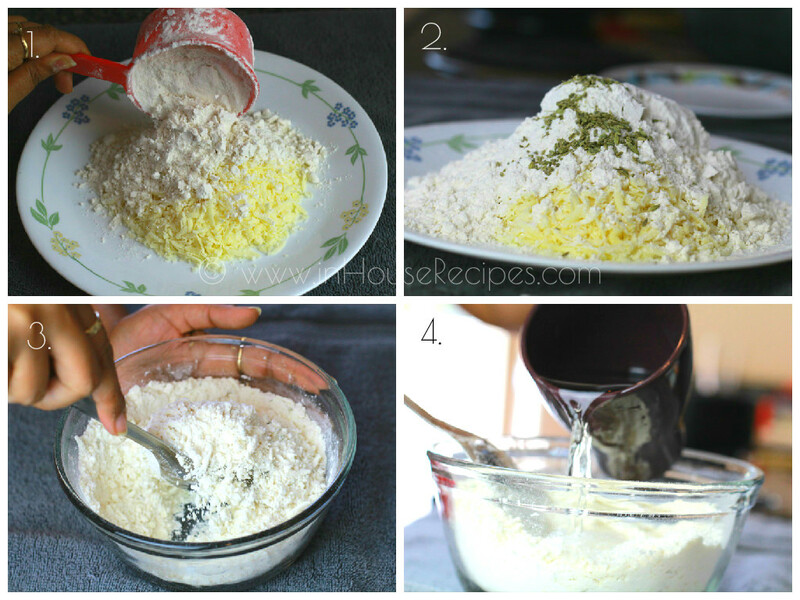 You can watch/read the recipe of Chashni here. Please note that we need a 1 string consistent Sugar syrup here. Take a frying pan (Flat base and about 1 inch depth). Add a thin layer of Oil. Heat it on high flame. 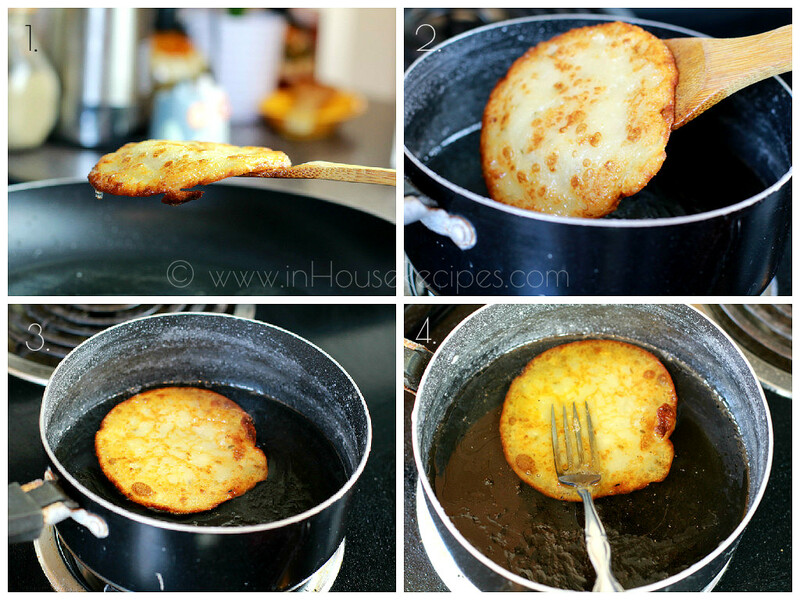 Once Oil is hot (It will take about 2 minutes), pour a tablespoon full of Malpua paste in pan. Turn the flame on low. Don't try to make a shape. It will take a round shape on its own. 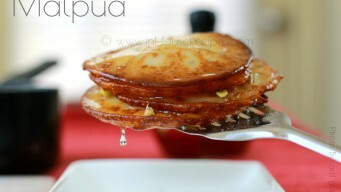 Pour Oil on top of Malpua using Spatula. Flip it when it gets golden brown from one side. 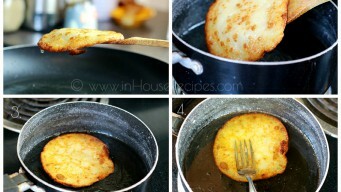 Take out the Malpua when it gets golden brown from both sides. 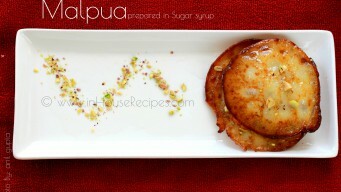 Now dip all Malpua in hot sugar syrup (Chashni) for 2 minute. Let it absorb the Sugar. 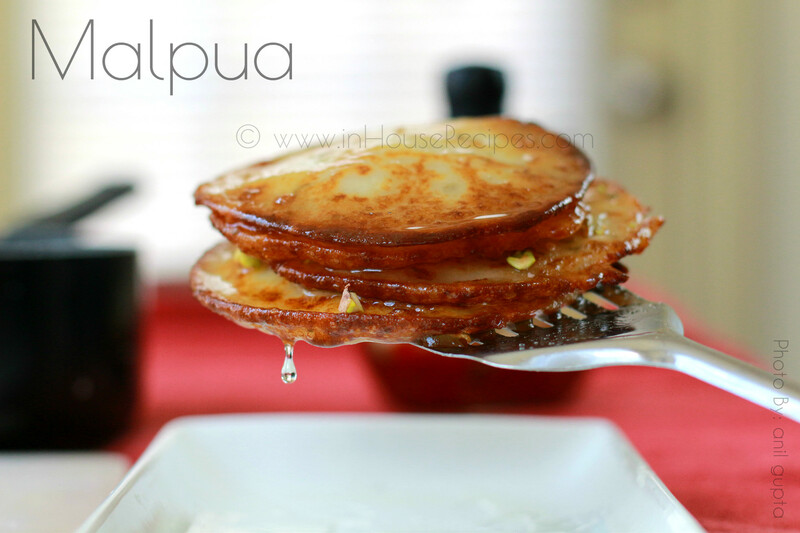 Hot Malpua's are ready to serve. Enjoy! 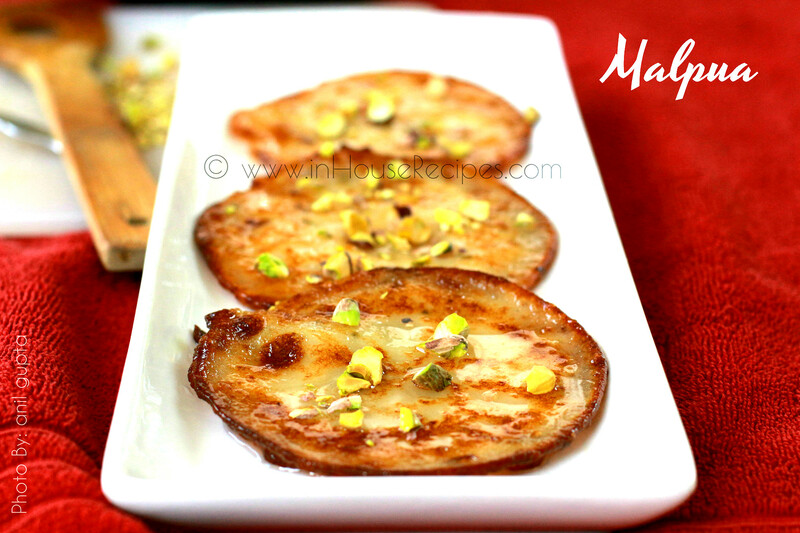 Garnish Malpua with Pistachio pieces before serving. Note that Pista should not be salted. 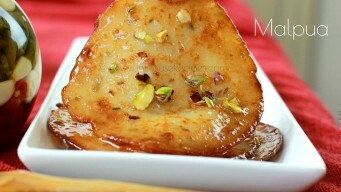 Malpua is also served with Rabdi on top. Maplua tastes best if served right after preparation. But, you can keep preserve it in refrigerator for 4-5 days easily. 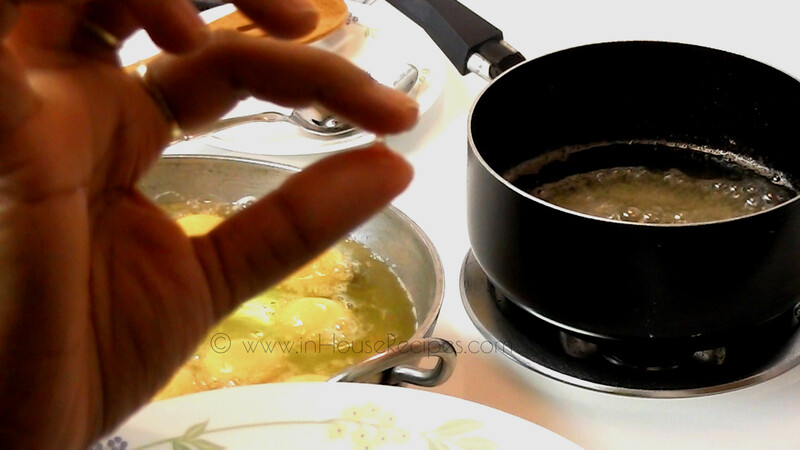 If you have refrigeration Malpua, then use the Microwave to re-heat before serving. If you refrigerate, then there is a good possibility that the Sugar syrup chashni will solidify too. It may or may not taste well if you plan to melt it again using microwave heating. So, it is advisable to re-heat using the stove.While you use stove, make sure that you have enough chashni in the heating pan to avoid Malpua’s burning.